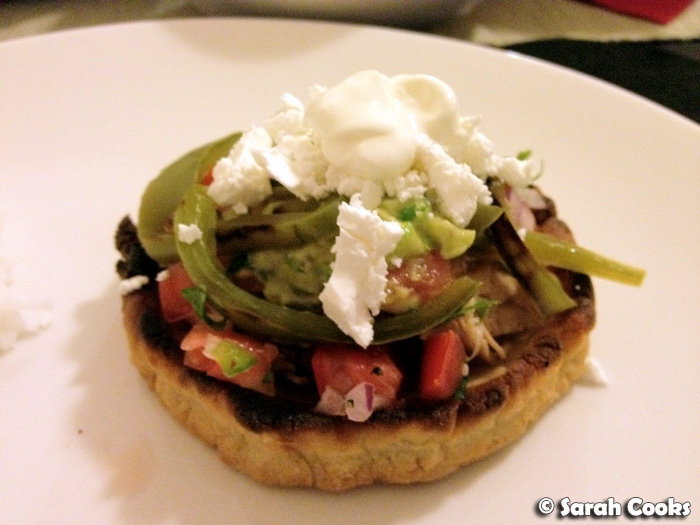 I told you I wanted to try making sopes, and make them I did! 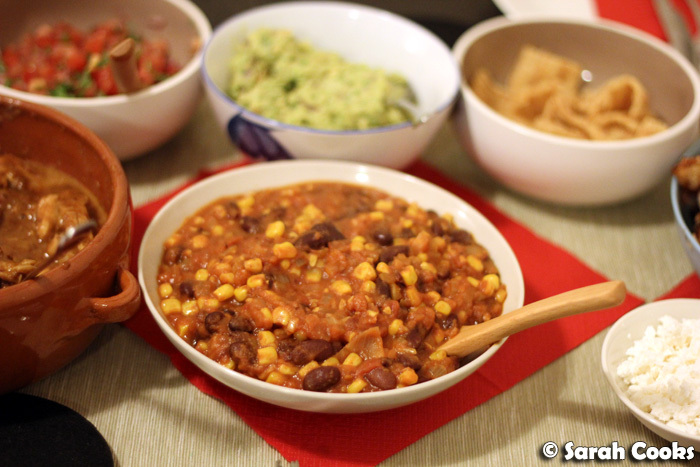 It's funny, it took my cousin Catherine and I two and a half years to organise our second Mexican feast, and then - bang! - we did number two and three in the space of two weeks! 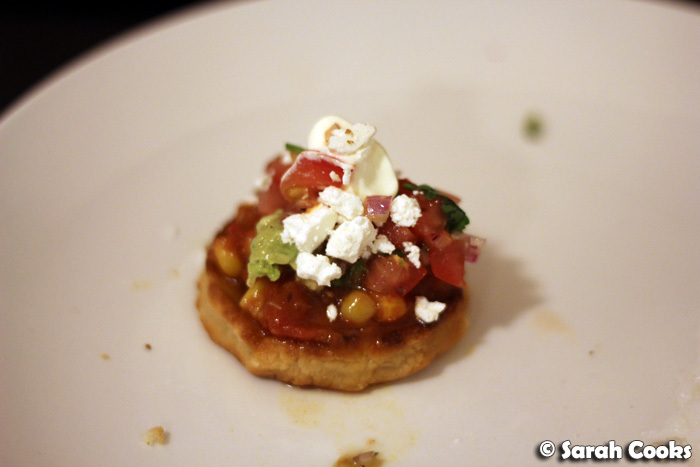 Sopes are basically fat little corn cakes, that you can top with anything you like. They're made with the same ingredients as tortillas, but without all that difficult rolling - they're so much easier to make, and in my opinion, just as tasty! 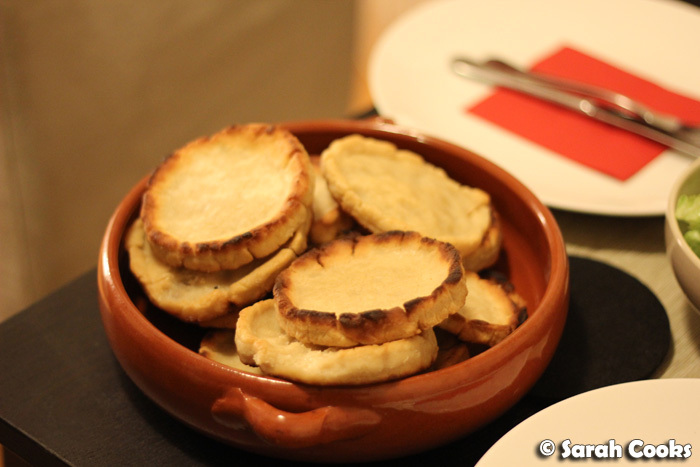 As you can see, the menu was pretty similar to last time, except that we had sopes instead of tortillas, added a vegetarian chilli con carne (or a chilli sin carne, to be more precise), and eschewed the luscious tres leches cake in favour of little shortbread biscuits. (I don't think Mexican Wedding Cakes are actually Mexican; I just wanted something small and sweet to go with coffee!) We also added slivers of green capsicum, sauteed until soft, to replicate cactus, and crumbled up some smooth feta to replicate queso fresco. I'm told you can only get tinned cactus here, not fresh, and apparently it doesn't taste very good. Another change I made was in the method for the carnitas. 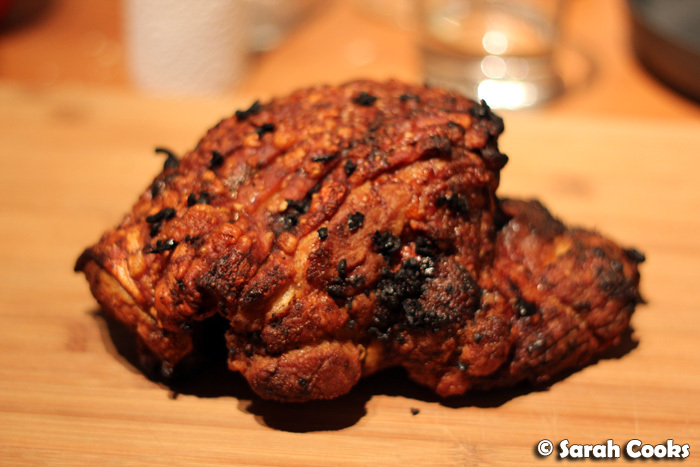 Last time David Lebovitz' recipe resulted in slightly dry meat - my fault, not the recipe's - so this time I used his spice mix, but decided to go with a method with which I'm more familiar, and slow-roasted a small pork shoulder instead. (Approx 1.25kg boneless weight). This also gave us the benefit of getting crackling! Earlier that day, I rubbed the pork shoulder with a mixture of oil, cinnamon, chopped up ancho chillies, chilli powder, and cumin, and roasted it for 30 minutes at 230C, then for 3 hours at 150C. 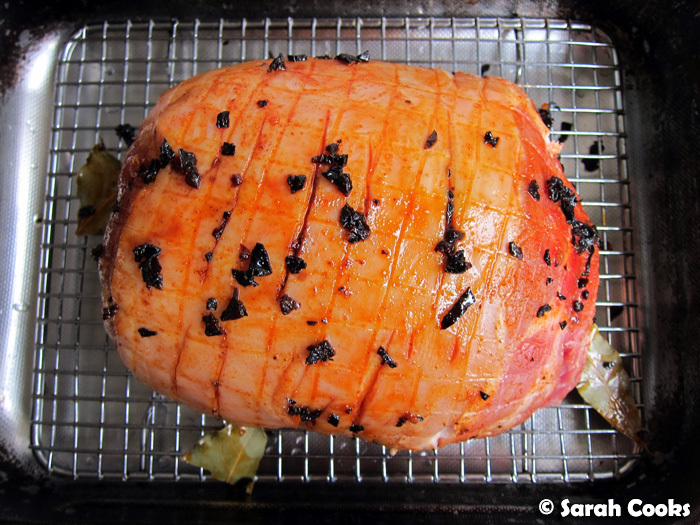 This resulted in crisp crackling and tender meat! 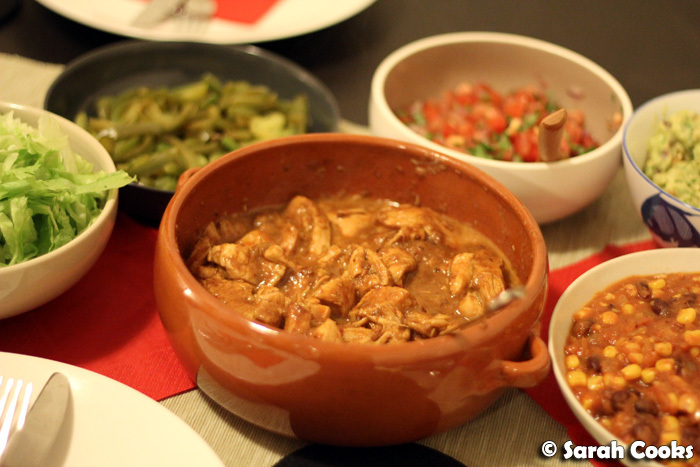 For the sopes, I used this recipe, but as with any traditional recipe, I'm sure every cook does it their own way. 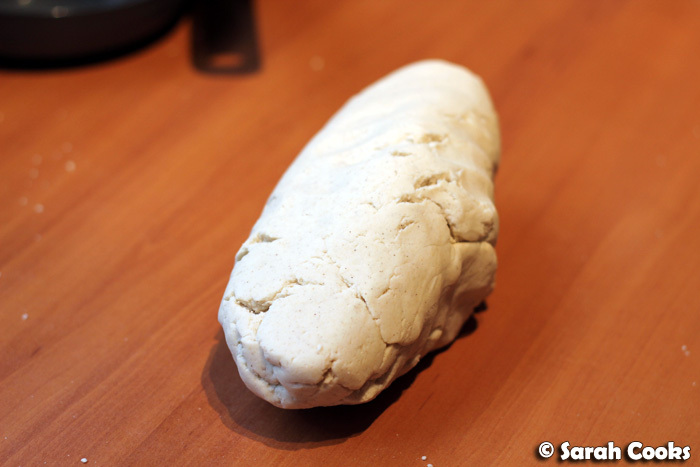 I mixed 3 cups of masa flour with 2 cups of water, a tablespoon of salt and a splash of vegetable oil, then kneaded it until smooth. Then we broke off little pieces, rolled them into flat discs and pinched up the edges to form a border. 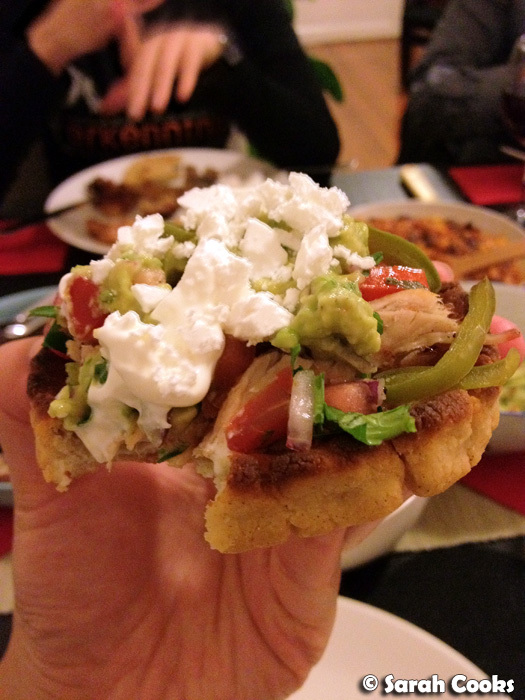 Catherine's Mexican sister-in-law also pinches the middle of her sopes to get a bit of texture, but I've seen recipes without this - so it's really up to you! With slightly long nails, I found it difficult to pinch up the middle of the discs, so I pressed indents into them with my knuckle. Easy! 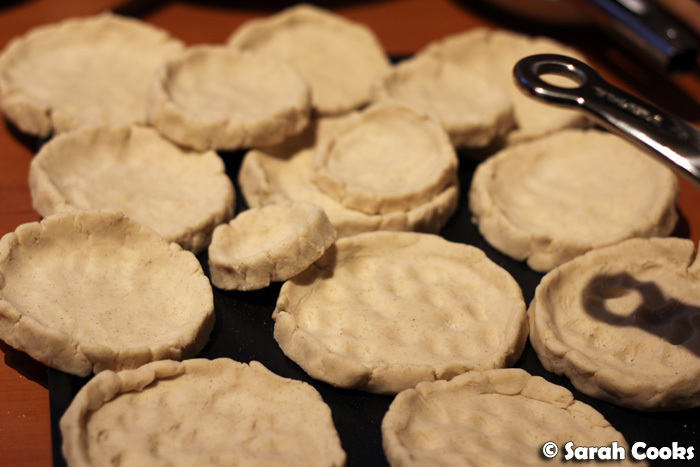 Then it was just a matter of shallow-frying them for a couple of minutes on each side. Done! I found that they didn't need a huge amount of oil, and still managed to cook through quite quickly. They were so easy to make, and somehow managed to be both dense and fluffy on the inside. And here are the assembled sopes! You can put anything you want on them; but I believe that it's traditional to have them with beans, cactus, and thin sour cream. We weren't sure if we'd have enough sopes, so cooked up some rice as well, but these babies are super-filling and dense - two or three would make a substantial meal! Tee-hee-hee, here's mine with a bite taken out of it! We finished the evening with coffee and crumbly Mexican Wedding Cakes and, um, endless rounds of Draw Something on our iPhones... because we are sophisticated adults! My God! That looks sooo good!!!! OMG...I loved the Sopes. I lost count of how many I ate that night. 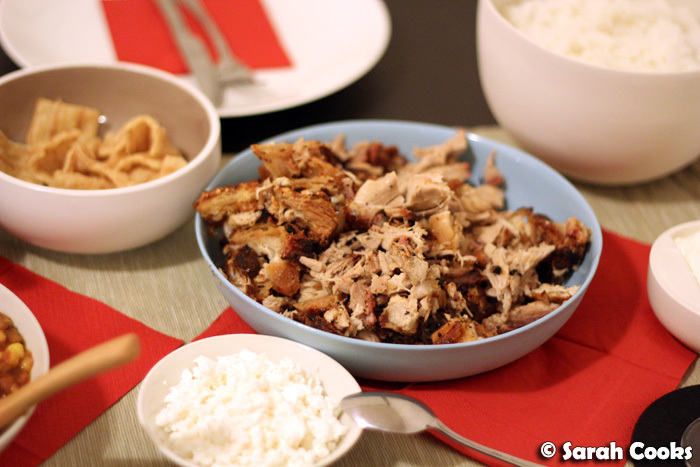 Loved the pork, loved everything. I-Hua - Thanks so much! !